Fight me when I say that the best lechon in the Philippines can be found only in Cebu. I mean, where else ‘di ba? And yes, I’m blogging in Taglish, and maybe Bisglish soon. Anyway, admit it or not, no festival or family gatherings would be complete without everyone’s favorite lechon. Having said that, The Mactan Newtown, in partnership with the City Government of Lapu-Lapu, is once again putting the spotlight on the world-famous Cebu lechon, along with the rich history, artistry, and skill that goes into preparing this celebrated dish, with the 2nd edition of its very own ‘Lechon Festival’. From August 1-12, foodies can indulge in the finest lechons right off the grills of Cebu’s best lechon craftsmen as The Mactan Newtown Lechon Festival entices the palates of tourists and guests alike in an authentic showcase of Cebu’s mouthwatering culture. “The annual gastronomic and cultural celebration is aimed at bringing awareness to small-scale and less commercialized lechon businesses. Apart from giving local businesses the platform to showcase their lechon products, we are also looking to raise the status of this great dish as a main pillar of food tourism in Cebu. Through this, we hope to grow Cebu’s reputation further as a top tourist attraction, while also becoming a catalyst for regional economic growth and more livelihood opportunities,” says Kevin Tan, head, Megaworld Lifestyle Malls. Megaworld Lifestyle Malls senior AVP and Head of Marketing and Business Development Tefel Pesigan-Valentino, and Lapu-Lapu City Tourism Head Hembler Mendoza shared details about the 2nd Lechon Festival to members of the press. Lapu-Lapu City is hosting the Ironman 70.3 Asia Pacific Championship, on August 3-5, 2018, an event that is expected to draw thousands of visitors to the historic resort city. A stopover at The Mactan Newtown is a must, then. Making this delicious gatehering even more appetizing is The Mactan Newtown’s introduction of exclusive lechon deals throughout the week-long festival. From August 1-12, guests can avail of a whopping price drop of P400 per kilo of lechon (per kilo of lechon is normally at P650-P750) for a limited time only (1521 hour is from 3:21pm to 4:21pm) from all participating lechon sellers. Lapu-Lapu City Tourism Head Hembler Mendoza, and Megaworld Lifestyle Malls senior AVP and Head of Marketing and Business Development Tefel Pesigan-Valentino immerse themselves at the Lechon Pit. Festival goers can also immerse themselves through the entire lechon preparation process at Mactan Alfresco’s very own Lechon Pit. Here they can witness how a lechon is made right before their very eyes – from seasoning to roasting at the coal pit, to portioning and serving on their own plates. In true Cebuano fashion, the festivity will also feature different cultural activities highlighted by the Grand Lechon Parade on August 3. 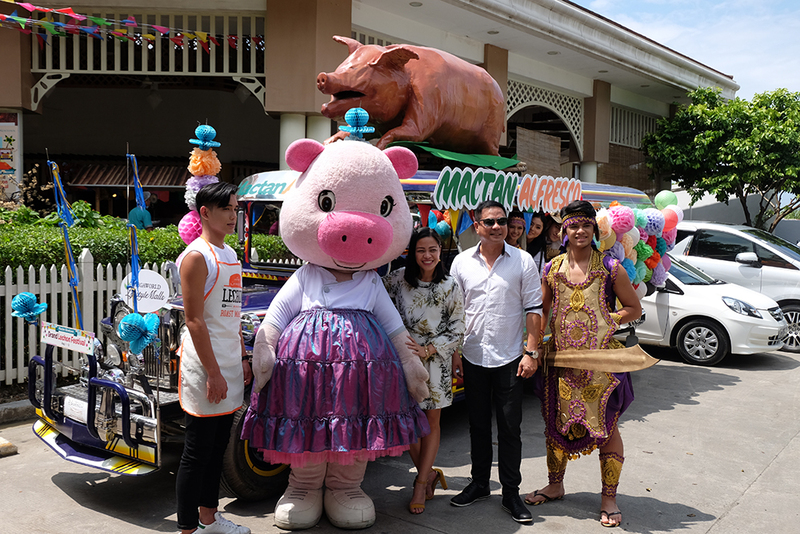 Cebu’s best lechon-makers will also showcase their own creative lechon masterpieces during the parade, which will also feature lechon-themed floats, performers and marching bands. A sreet dance party follows the grand parade with the celebration culminating in the evening at the Lechon Night, where guests can feast on lechon, grilled meat, and seafood while being treated to live performances from local bands. A mobile bar will also be stationed at the venue during the event, which will be capped off with a grand fireworks display. More must-see cultural performances will be unraveled on August 4-5 and August 11-12, to give the crowd a glimpse of the province’s proudest moments in history. Immerse in Filipino culture and enjoy a fun twist to classic Pinoy games through exciting pocket activities that include giant versions of piko, tumbang preso, and habulang biik, also at the Mactan Alfresco from August 3-5, beginning 5PM. As an added treat, guests can also shop for gifts, souvenir items, and other delicacies at the Lechon Festival Fair. P.S. Check out Dexter Alazas’ ARTESANO Pop-Up shop at the Mactan Alfresco from August 1-5, 2018 which features bags, accessories, swimwear, and footwear, together with other local products and souvenirs made in Cebu. Love local!